This week I came back to my parents place to visit them. I keep some of my old computer parts and books here and I thought I would share some photos. 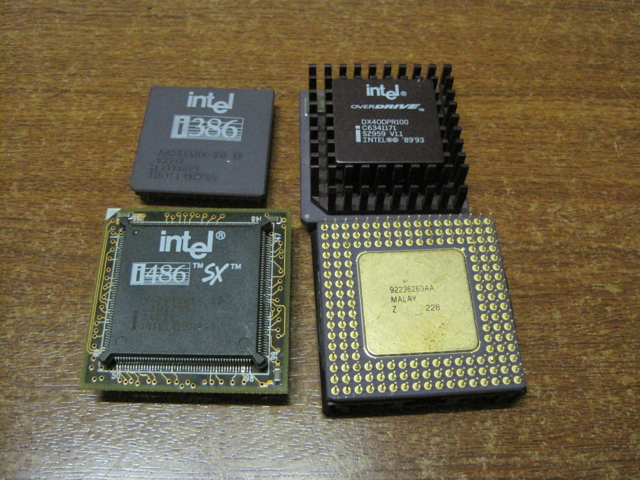 First up we have some processors, a 20Mhz 386DX along with the much rarer Intel Overdrive and 486sx that is mounted for use in a socket. The fourth processor I couldn’t identify because of a permanently attached heat sink. 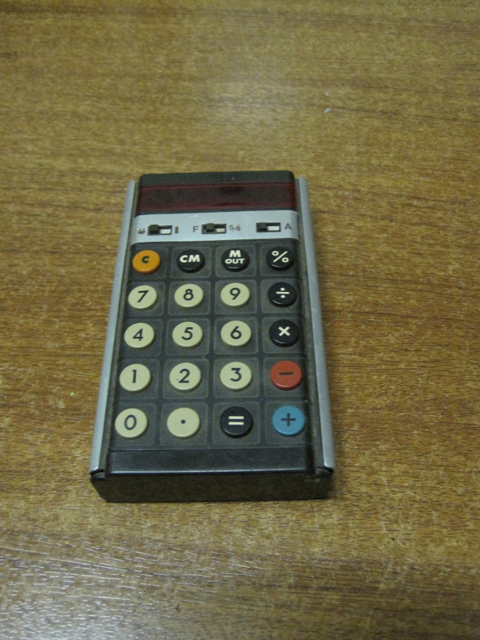 This is my Dads old calculator that he bought back in 1975! Its got an LED based display and even came with a power pack for when the batteries ran out. It’s built out of a number of circuit boards and Dad couldn’t remember who made it. The only label on it says made in England. These two cards came out of a Reply Corporation machine that my Dad bought. I believe they are micro channel architecture cards. IBM introduced the standard to try and make the main bus of PCs proprietary so they could charge clone makers royalties. It didn’t work out for them in the end. 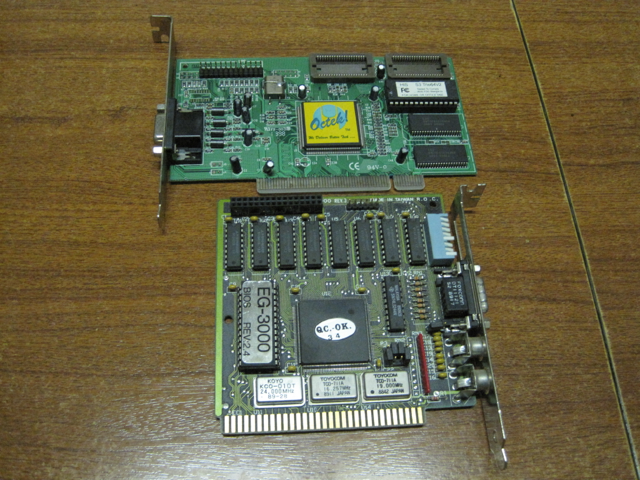 The top card is a IBM SCSI card with a card edge connector instead of the conventional one. 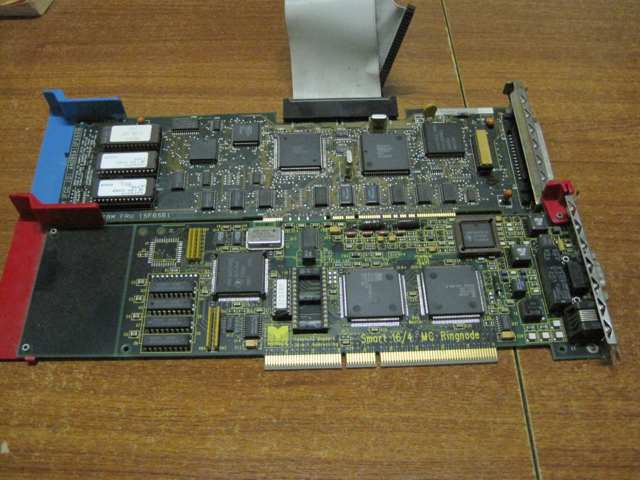 The bottom one is a Madge Ringnode card, which is a token ring network card. This type of network was popular before Ethernet came along. This is a Western Digital Hard disk controller from an old Epson computer an uncle gave my dad. I’m not sure if it’s for RLL or MFM drives but at least it seems to have a mask ROM that should have the low level format utility in it. 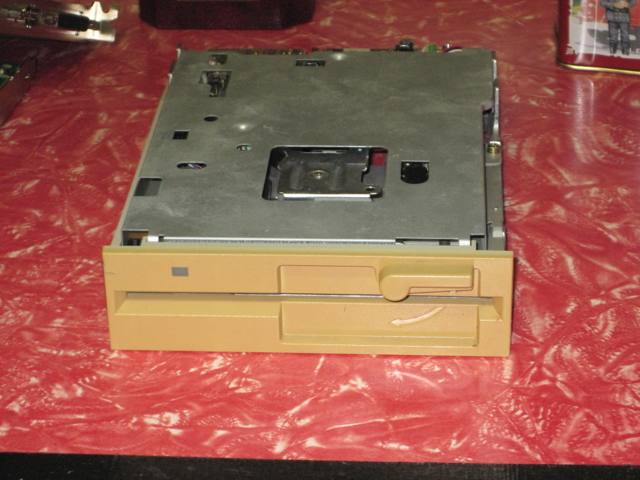 This is the floppy controller from the same Epson computer, it has a Western Digital chip on it. It also has a serial and parallel port as was common on early PCs. 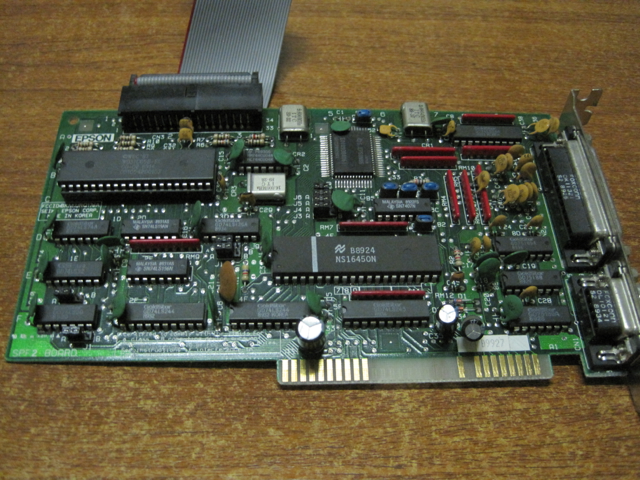 An EG-3000 EGA graphics card, it must be a later model as it’s quite small. The PCI VGA card is there for size comparison it’s a S3 Trio64. 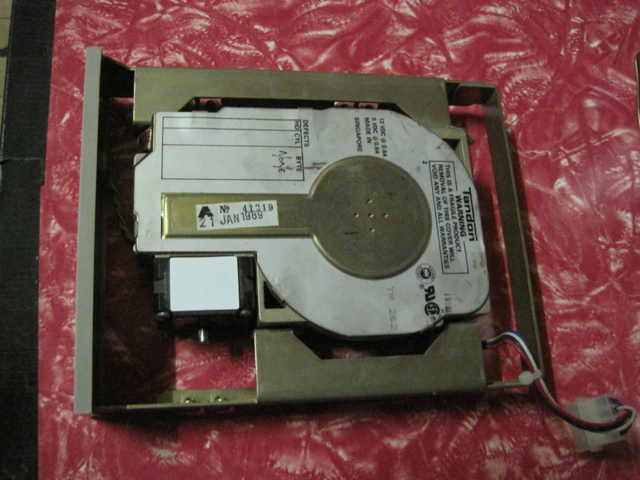 This is an NEC FD1157 floppy disk again from the Epson computer, it’s an early 1.2Mb drive, you can tell by the stepper and spindle motor being larger and older style. 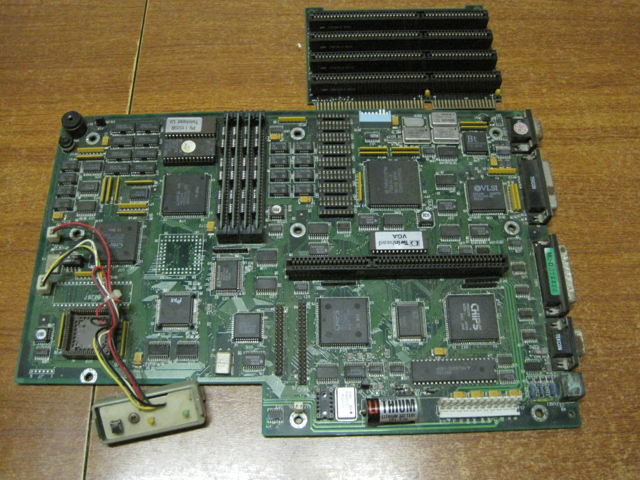 This is our old 386sx main board from our first PC, a Twinhead Superset 590. It has some damage from a leaky external battery, fortunately the board still works, but some connectors require replacement. 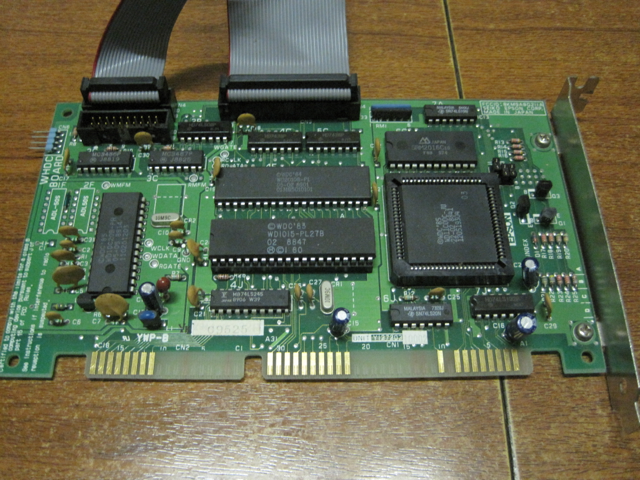 The board has a chips and technologies chipset and a Paradise VGA adapter. The chassis was unfortunately ruined by the battery. 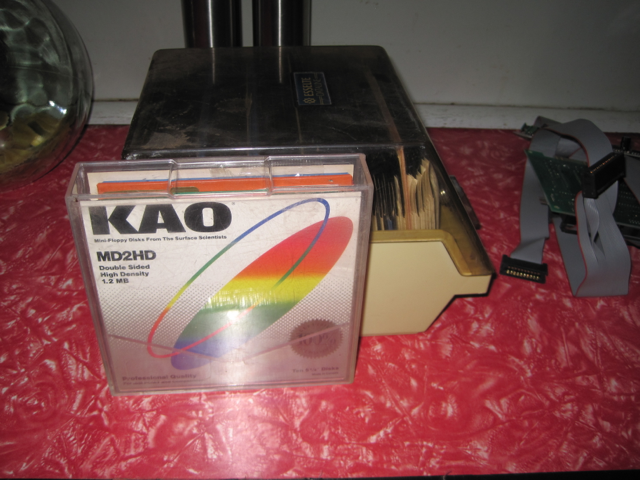 Dads floppy disk storage box and some KAO blank floppies in the box. I remember these primarily for how colourful they are. A Tandon hard disk drive. I’m not sure but I think these drives like these could use different encoding methods, either MFM or RLL. The controller was largely responsible for most effort in encoding. This drive uses a stepper motor like many other old drives and is mounted inside a bracket with a faceplate and activity LED. 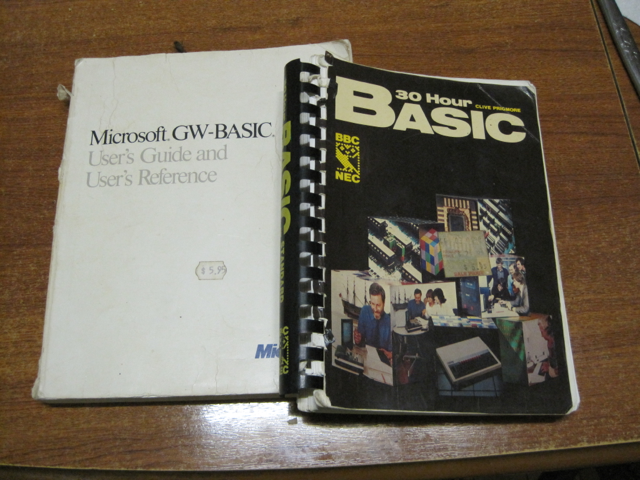 The 30 hour basic book is what I first learned programming with, as you can see it was really for the BBC micro computer. I was using gwbasic on the 386sx pictured earlier. The gwbasic reference helped me learn more about the language and filled in the gaps. It meant I could achieve more with the graphics, until I ran out of memory. 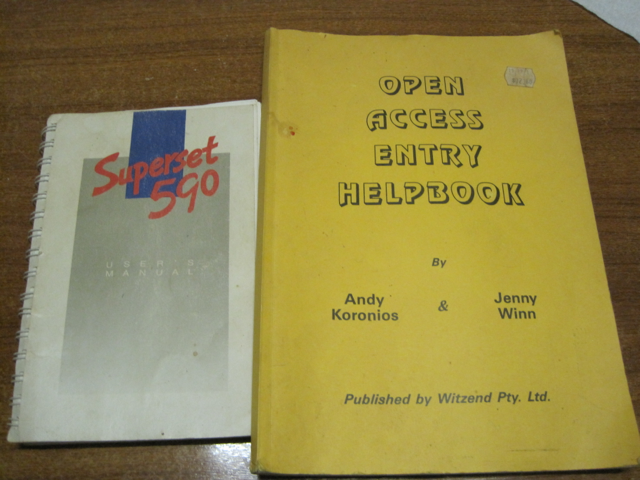 Here is the main board manual and the Open Access handbook. The latter is for a office suite that we used before getting Microsoft Works. 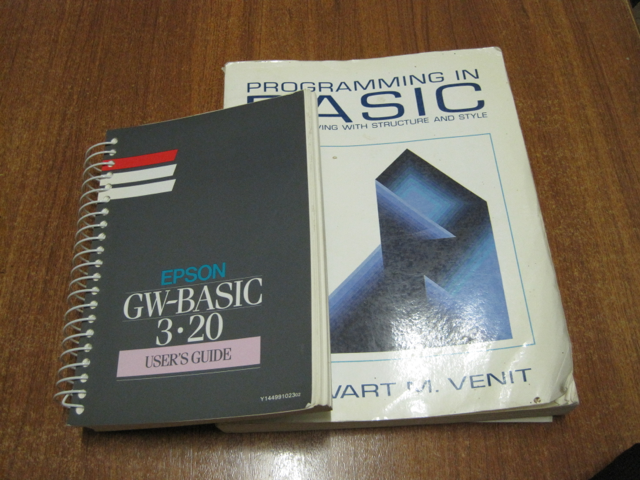 Finally here is the gwbasic manual I was lucky enough to get with the Epson computer, it’s basically the same as the previous reference manual. When the Epson was built it was common for machines to come with programming manuals. Many early databases and basic commercial software was written using basic, gwbasic made porting these easier. Usually they came from CP/M machines. Having recently upgraded the disk space on the Sparcstation I decided I would go about installing a bunch more useful utilities and some games. I installed some image processing and capture software called XV so I could capture screenshots on the machine, this is what I’ve used to capture todays screenshots. Todays games were too small to justify a whole post to themselves, so I thought I’d post about a few of them together. One of the first games I built and tried was greed. It runs in a colour terminal and can be played via SSH or telnet. The game is very simple, you are an @ symbol in a playfield full of numbers. You move in the direction of one of the numbers which causes you to move that distance, erasing numbers as you go. In order to be allowed to move in a direction you must be able to travel the full distance specified by the number without hitting a border or an area you’ve already erased. The game ends when you can’t make any more valid moves. You use the numeric keypad to move, which for me felt reasonably intuitive. The game has some nice in game help, and is simple to get running and play. It doesn’t take long to play so it’s good to for a quick distraction. This game is modeled after missile command from the arcades, but with one difference, it’s in 3d. The vector graphics are quite nice but can be a little slow over a network connection for some reason. Fortunately the game has some built in commands to change the graphics settings. The controls are also a bit awkward, I found that it was too sensitive, such that small mouse movements often moved my targetting reticule way too far. Fortunately the difficulty curve isn’t too steep, but the control for this really let it down. Xbomber is based on the bomberman series of games. It is interestingly a multiplayer game, but not implemented the way you might expect. The one program can connect to multiple X servers, allowing two players per server sharing the one keyboard. There is a maximum of four players over four X servers. You can also play solo against the computer AI, but it really is quite a weak player, it looks like it is just making random movements. It is probably not the easiest thing to set up the multiple displays, X authority stuff would surely get in the way, but I’m sure it can be done. XJump is a simple platform game where you have to climb a tower. If you fall off the bottom of the screen the game is over. Controls are simply the arrow keys and work quite well. The part of game that will catch you out most often is the seemingly frictionless movement of your character. It is quite easy to jump and fly off the other end of the platform you’re jumping for. So it means you have to be quite careful how fast you move when jumping larger distances. Another game that is quite fun, but short. I’m not sure where the name from this one comes from, it is a simple maze shooter, where you have to collect a number of animating stars around the level. You have to either avoid or shoot the badies around the levels, some of them will shoot at you. I’ve been caught out by bullets wrapping around the edges of the screen, I often shot myself! You can use this to your advantage, but more often than not it ends up hurting you. It’s a good little distraction, but the graphics could have been a little prettier. Finally XWorm is basically a snake game plain and simple. It has some nice graphics, and simple controls that are easy to use. It plays quite fast, so you have to have pretty good reflexes to play for very long. There is only a bunch of mushrooms on screen to avoid, and a fence around the edge, so even Qbasic Nibbles has a bit more variety! Otherwise it plays quite well. So there you have it, a few simple games that work on pretty much anything you can run NetBSD on with an X server (or from an XTerminal). Most of these were simple little distraction type games rather than anything you’d spend a lot of time playing. 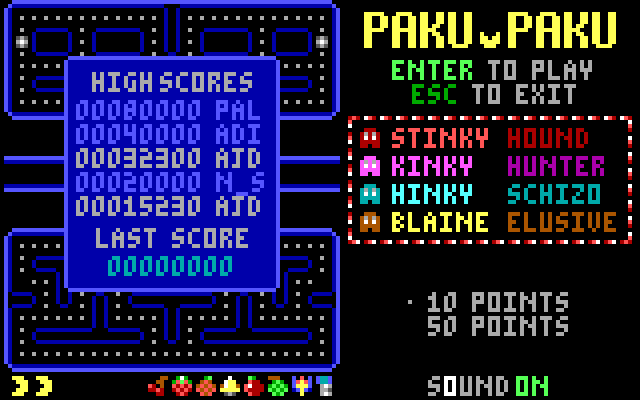 They are for the most part quite fun, and a reminder of what games under *nix like systems used to be like.